Hunting books including New Zealand and overseas. Small game, big game, pest control etc. A guide to gamebird and waterfowl shooting in New Zealand. With idenification of species, protected species, gear, choosing a gun-dog, cartridge loads etc. A Tackle House Publication 1974, 80pp. 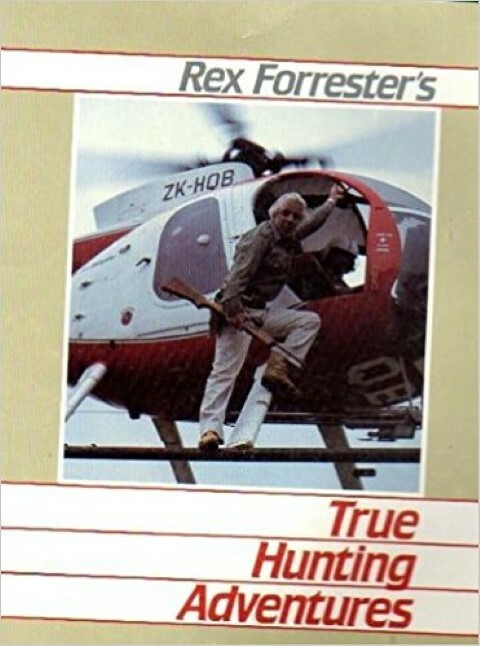 Forrester recounts ten years as a hunting guide in New Zealand. Shooting deer, chamois, pigs and thar, angling for tout, and bagging any other game that passed by. Stories from his lifetime of recreational and commercial hunting. 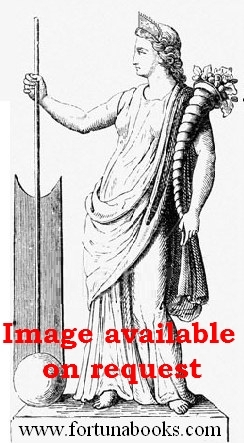 Illustrated with photographs in the text. 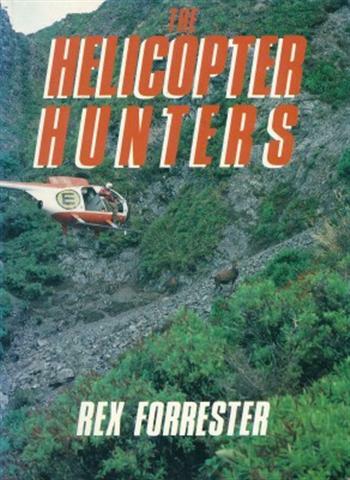 Forrester's follow up to his classic 'The Chopper Boys', the story of the helicopter riding deer hunters, both shooting and capturing them live for stocking deer farms. The story of the helicopter riding deer hunters, both shooting and capturing them live for stocking deer farms. 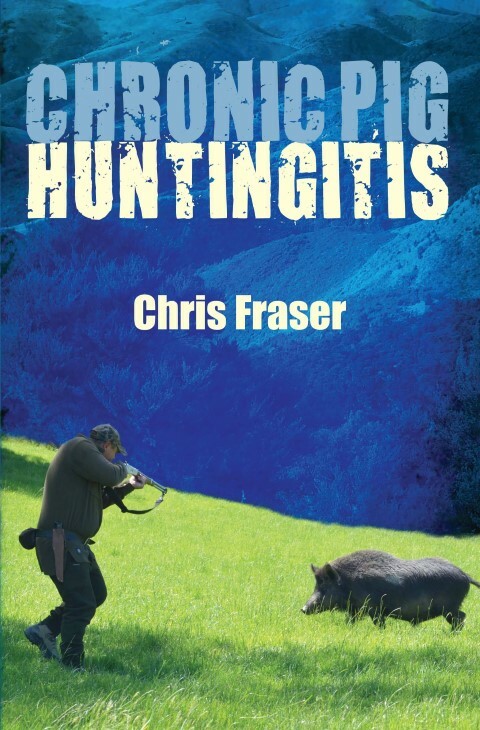 Chris described the symptoms of Pig Huntingitis, as owning a 4WD truck with a dog box on the back, a long pointed knife, a collection of motley looking dogs and when you are talking with your mates every second sentence has the word "pig" in it at least once. Fortunately not a life-threatening problem, except possibly for the pigs. The progress from just infected to "chronic" is described in the stories in this book. As it progresses it involves wives, children, friends and even casual acquaintances. Rather than alarming it becomes life affirming as lots of fresh air and exercise in the pursuit of pigs improves overall health and the pigs provide nutritional food that is totally organic and as free range as it is possible to be. Hunting New Zealand's South Island West coast amid rugged mountains and bush. Illustrated throughout with photographs. VG hardback in VG dustjacket. Short inscription to paste down. Reed 1982 first edition, viii 136pp. New Zealand Government deer cullers in the Urewera. Helmer spent time culling deer with Barry Crump in the bush, and he is mentioned. Includes photos of the cullers. G+ hardback with sunned spine and no dust jacket. VG+ hardback with VG- dust jacket with chipped spine ends. Name and address to fep. Fawn, The First Year in the life of a Red Deer in new Zealand. A history of the wild pig in New Zealand and it's ancestors abroad. 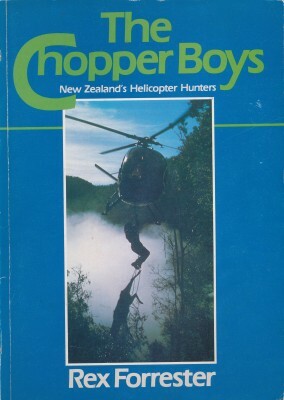 Holden gives tips and hints and also recounts his own experiences pig-hunting throughout New Zealand. Hodder and Stoughton 1992, 152pp+ plates. A complete guide to hunting in New Zealand. From selecting your equipment and firearm, to the various species of big game, and their habits and habitat. Whitcombe and Tombs 1968 first edition, 218pp + plates. New Zealand hunter Gary Joll and friend bag big game in Alaska, including bull moose, caribou and black and grizzly bears, Also getting antelope and deer in Wyoming, Entertaining and dramatic accounts. Kelly was a police ballistics expert, and he has combined this knowledge with his pastime as a hunter and outdoorsman. Tales of deer, pig, geese, duck and pheasant. Illustrated by Peter McIntyre. 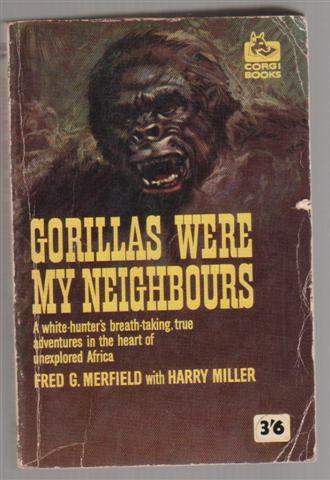 Hodder 1968 first edition, 159pp+ plates. Memoirs of a veteran deershooter. Jack McNair (born 1882) tells of the hard days as a Government deerculler in the 1930s. He was employed under the direction of G F Yerex. After his deerculling period McNair took a job on Molesworth Station. VG hardback in VG dust jacket. Name to first page. 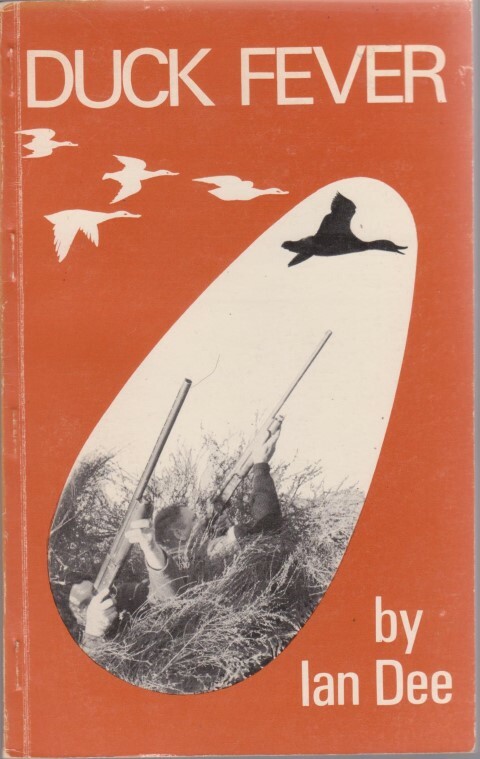 Reed 1971 first edition, 153pp. White hunter after various big game as well as much African anthropological information from Mendjim Mey country in the French Cameroons. G+ paperback with light creasing to covers, aged paper stock. 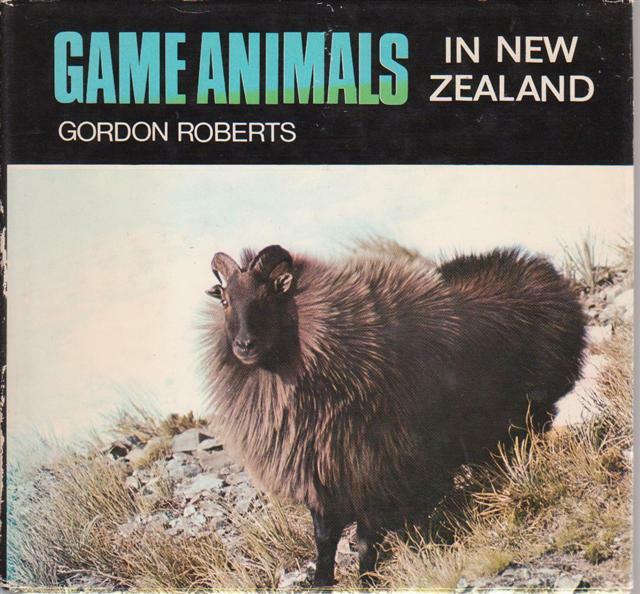 Descriptions and colour photography of game animals and their habitats in New Zealand. More in depth than its size and appearance would suggest. VG hardback in G+ dust jacket with some wear and tears. Severinsen recounts his hunting expeditions in New Zealand, where he guides paying clients into the New Zealand back country. Includes North and South Islands, Fiordland and Southland, and Stewart Island. VG+ hardback in VG dust jacket. As an amateur hunter Severinsen progressed from stalking in the North Island and South Island to the plains of India and America. 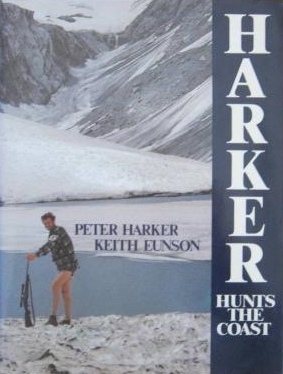 Chapters include hunting at Taupo and the Ruahines; Thar and Red Stag stalking in the Alps and Wallaby in South Canterbury; Bear, Moose and Goats in Alaska; Indian big game. Reed 1963 first reprint after 1962, 228pp + photographs. SLEEMAN Lt. Col. J. L.
Tales of a Shikari or, Big Game Shooting in India. Author was Director of Military Training for the New Zealand Forces under the Royal Sussex Regiment. Illustrated with plates by W A Bowring.Cover states proceeds from sales go to Red Cross and Ambulance Service. 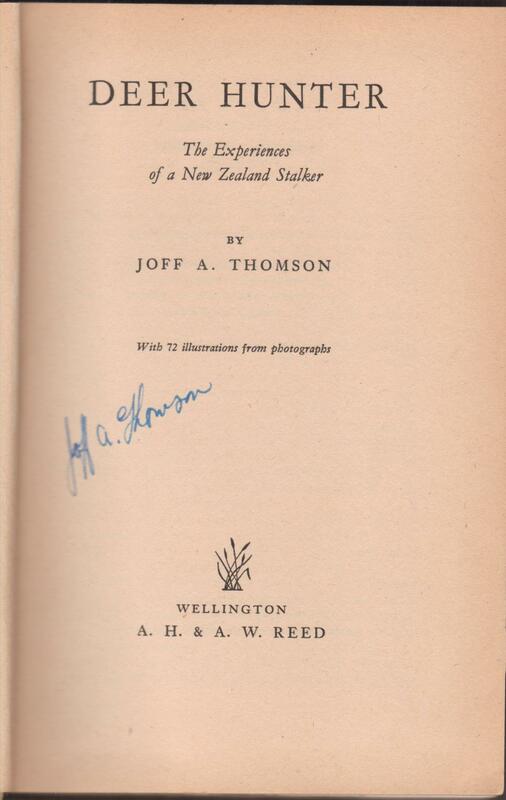 Joff Thomson was a Government employed deer culler in remote areas of the South Island. 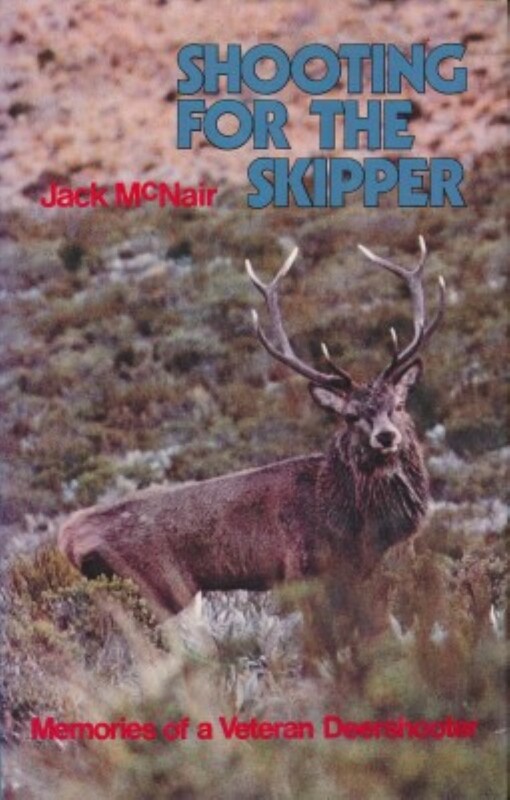 This book focuses on his time hunting red deer, but he also tells of wild-goat hunting in Marlborough and of successful Wapiti hunting expeditions in Southland's great lakes and fiords. VG hardback with no dust jacket. Former owner name to free end paper, and the author's signature to the title page. RARE author signed copy. AH and AW Reed November 1952 First Edition, 194pp + plates. VG hardback with VG- dust jacket with light curl to bottom edge. 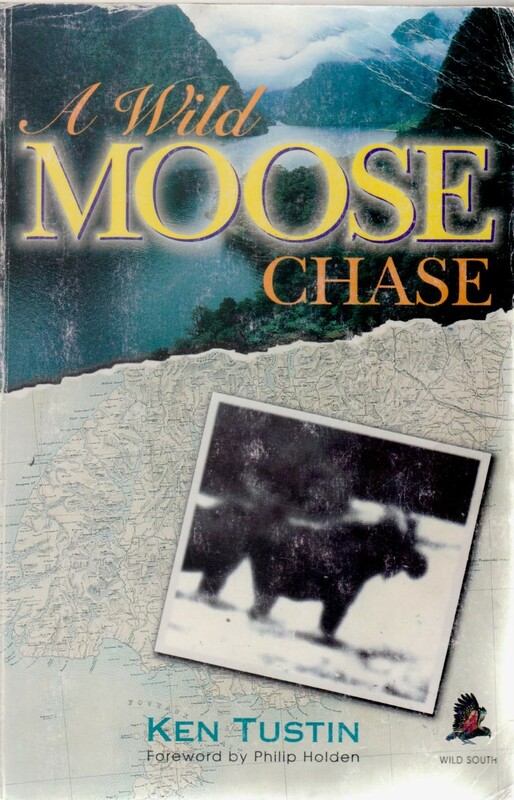 Tustin recounts his quest to find any remnants of moose in Fiordland. He believes he has camera footage and other evidence of their continuing prescence. Wild South Books 1998, 224pp. VG- softback with worn wrappers, scattered pencil annotation.